So I just finished my last exam today… Followed by feelings of what I perceive to be a total body meltdown. Boy, do I wish I was still in highschool! Why, you ask? Because back in highschool, I remember mutilating our Chinese textbooks (yes, chinese text books) with scissors! I was, of course, too square to do it. Then again, I did throw all of mine away eventually. Oh how I wish I could BURN THEM ALL. 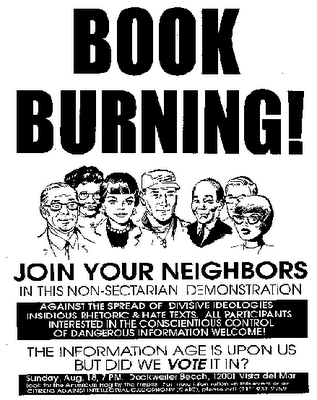 BURN ALL BOOKS! BURN THEM AND WATCH THEM DIIIIIIE!!!!! Alas, books cost money. And alas, the money was my own. A funny idea struck me – that I should search the interwebs for book-burning images just to quell such a strong tendency towards destruction post-exam. 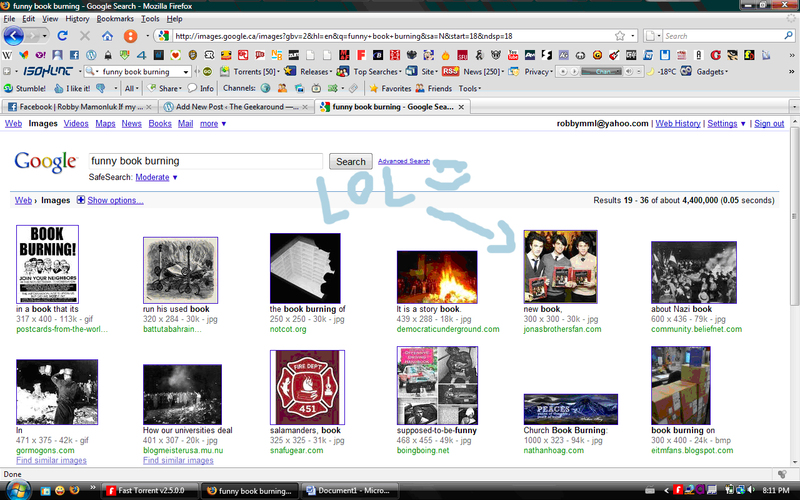 So I typed up “funny book burning” on google… Ya know what I find? In other news, yes, my books will be gone because I’m going to try to get my money back by selling ’em… CURSE YOU BOOKS! I HATE YOU! Looking back at the rise of conservative radical religious and right-wing movements to ban books from teaching the devil’s word of evolution and free independent will, I sure wished it was that easy to get rid of them books. Living in a post-modernistic world, we ought to go back to our roots, into the primitive days wherein neighbors would come together and shun the evolution of species in radical protest. We ought to bask in the elaborate ambiance of burning sociology books, while reaping the benefits of objective HATE. LOL. I’m just one bag of anger and frustration right now. Take that, 21st century progress! That'll teach you to mess with our misguided understandings and ignorance!